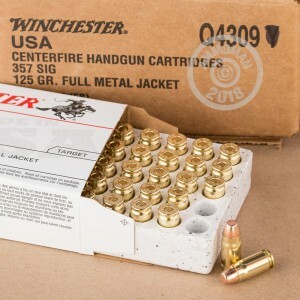 357 Sig Winchester USA Full Metal Jacket ammunition is an excellent choice for target and range shooting. For decades, Winchester products have dominated the ammunition industry. 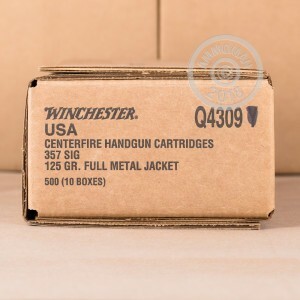 This product is a member of Winchester's most commonly used line of products. The price is affordable and results consistent making it a leader in handgun ammunition. 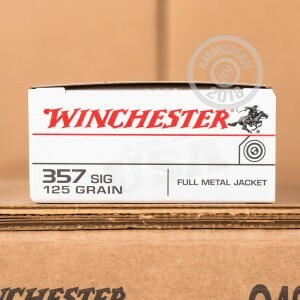 This 50 round box of 125 Grain Full Metal Jacket ammunition will arrive in brand new condition. The reloadable cartridges have boxer-primed brass casing. The primers and powder are also non-corrosive, therefor you can relax a bit about rushing home to clean your barrel immediately after shooting. Winchester has a rich history dating all the way back to 1866. Their guns and ammunition accompanied American settlers as they moved west to seek their fortunes. Today, Winchester is still referred to as "The American Legend" with the famous horse and rider logo used on its products to symbolize that legacy. Winchester continues to maintain a high standard of quality, making it a consistent leader in the ammunition industry.